Build a charcoal fire for indirect cooking using Kingsford® charcoal by arranging the coals on one half of the grill’s charcoal grate, leaving the other side void. Adjust the bottom grill vents to bring the temperature to approximately 400°F. Cut kielbasa into 8 to10 1-inch slices. Cut the top ¼ off of each sausage section then set on a cutting board with the ¼-inch section stacked on top of the ¾-inch section. Tightly wrap each sausage stack with a slice of bacon and secure with a toothpick. Place the bacon wrapped sausage sections on the cool side of the grill and cover the grill. Allow the sausage to cook for approximately 45 minutes until the bacon is crisp and browned. As the sausage sections grill, combine the remaining ingredients in a small mixing bowl and blend well. Refrigerate the pimento cheese until ready to use. Remove the bacon wrapped sausage sections and use a fork to gently remove the upper ¼-inch section from the stack while keeping the bacon wrap intact to create a bowl. 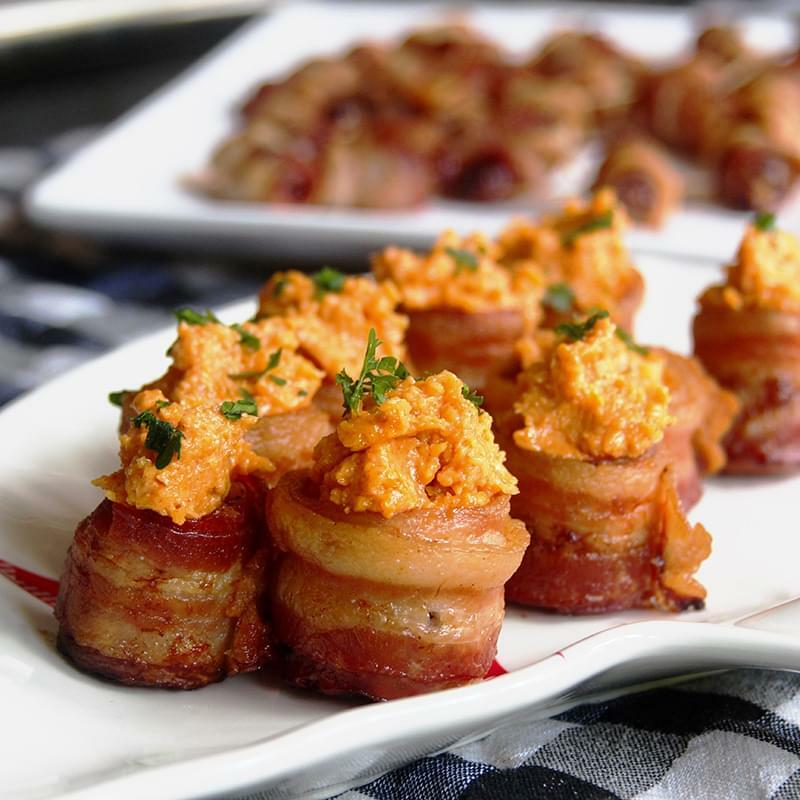 Stuff the top of each pig bomb with a generous helping of pimento cheese. Chill until ready to serve.